Thomas Hariot, 1560-1621, John White, fl. 1585-1593, illustrated by, and Richard Hakluyt, 1552?-1616, translated by A Briefe and True Report of the New Found Land of Virginia: of the Commodities and of the Nature and Manners of the Naturall Inhabitants : Discouered bÿ the English Colonÿ There Seated by Sir Richard Greinuile Knight In the ÿeere 1585 : Which Remained Vnder the Gouerenment of Twelue Monethes, At the Speciall Charge and Direction of the Honourable Sir Walter Raleigh Knight Lord Warden of the Stanneries Who therein Hath Beene Fauoured and Authorised bÿ Her Maiestie and Her Letters Patents / This Fore Booke Is Made in English by Thomas Hariot seruant to the Aboue-Named Sir Walter, a Member of the Colonÿ, and There Imploÿed in Discouering. 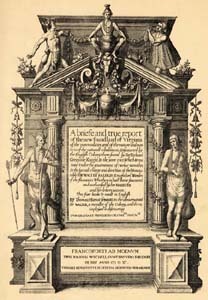 A Briefe and True Report of the New Found Land of Virginia: of the Commodities and of the Nature and Manners of the Naturall Inhabitants : Discouered bÿ the English Colonÿ There Seated by Sir Richard Greinuile Knight In the ÿeere 1585 : Which Remained Vnder the Gouerenment of Twelue Monethes, At the Speciall Charge and Direction of the Honourable Sir Walter Raleigh Knight Lord Warden of the Stanneries Who therein Hath Beene Fauoured and Authorised bÿ Her Maiestie and Her Letters Patents / This Fore Booke Is Made in English by Thomas Hariot seruant to the Aboue-Named Sir Walter, a Member of the Colonÿ, and There Imploÿed in Discouering. Indians of North America -- Virginia. North Carolina -- Discovery and exploration. Roanoke Island (N.C.) -- Discovery and exploration. Virginia -- Discovery and exploration.